Silverwood is back and ready for guests to flood through the gates! Every year, guests come from miles around to visit Silverwood and Boulder Beach for several reasons. Some come because they grew just enough over the winter to finally ride Timber Terror, some visit because they can’t wait to watch Nick Norton’s new show, and some come to enjoy all the tasty treats. If you or your family are “foodies” at heart, then most likely you were looking forward to coming to the park to partake in some delicious dining experiences. It’s no secret that Silverwood is the home to several specialty sweets, and this guide will help you plan your day while tasting all of the goodies on your list. No matter what your budget is, we will help you get the chance to have a pleasant treat during your visit. Most guests do not know this, but you are actually allowed to bring a soft-sided cooler that is no larger than 12 inches in any dimension. This means that you can pack small snacks and empty reusable water bottles to keep on hand if you don’t have much time to stop and eat. This will also make room in your budget for that Caramel Apple Funnel Cake that you have been wanting to try at the Sugar Shack. If your family loves to treat themselves to fountain drinks and souvenirs during vacation, then it is worth your while to purchase one. 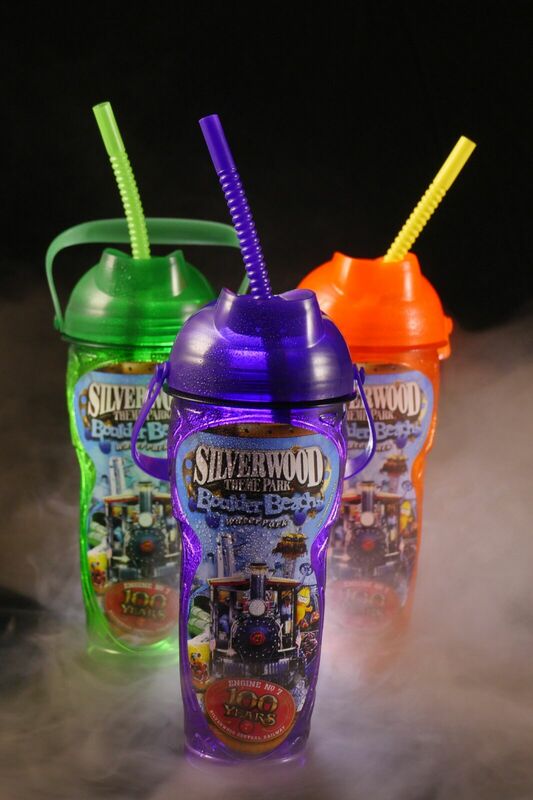 Silverwood offers their souvenir sports bottle at an amazing price up front; you get free refills on the day of purchase, and then you are able to bring your cup back any other visit and refill it for only 99 cents! There is a reason that Silverwood sells about 56,000 pounds or 338,000 individual strips a year. People love them. The best part is that they are sold throughout the entire park! You can purchase them at the Chicken Shack or the Granite grill if you are in the water park. If you are in the theme park, then you can get them at the Country BBQ, Kool Kactus, and Lindy’s. You deserve a break. Tell the family that they can find you floating around the lazy river if they need to get a hold of you. While you’re at it, float up to the Cove and get yourself a Pina colada slushie. You can thank us later. Silverwood focuses on quality throughout their entire park, especially in their food and beverage department. But after a long day, it’s nice to have an enjoyable meal in a full-service restaurant. Lindy’s offers the opportunity to sit back and relax, while enjoying some of the finest food in the park. They offer quality burgers, crisp salads, and mouthwatering ribs. Make sure to stop by for dinner to wind down from the busy day. Lindy’s is located between the info center and the train station. We get a lot of questions from our gluten-free guests about where they should dine at the park. The majority of our items throughout the park can be made gluten-free, all you need to do is ask. We went ahead and asked our Food and Beverage Revenue Manager, David Lee, what places he would recommend. He first recommended eating at the Kool Cactus in Roller Coaster Alley. He said that the majority of the menu is gluten-free. The beef and tortillas are not. This is the best valued gluten-free option. Right around the corner is the BBQ Pavilions where the entire menu is gluten free except for the buns and pulled pork sandwiches. If you wanted to see the magic show during your visit, David said that gluten-free pizza is available at the Theater of Illusion upon request. 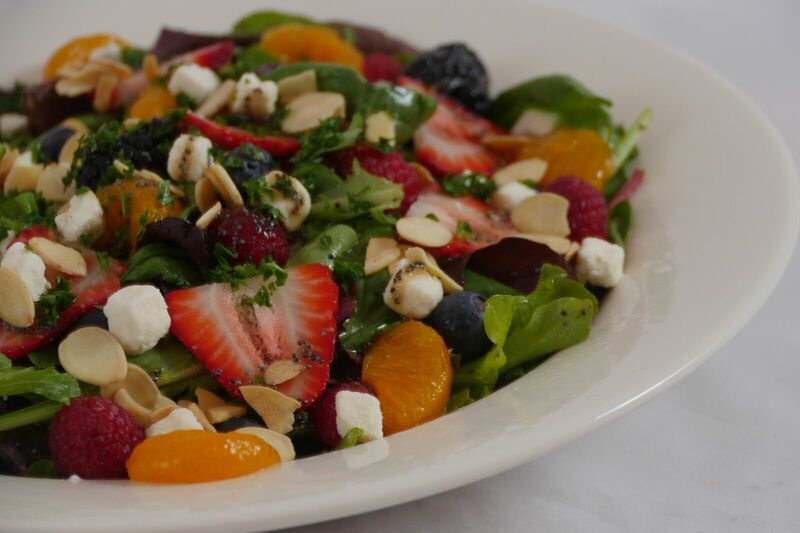 Finally, if you want the most customizable experience, Lindy’s has a large variety of gluten-free substitutes. We take gluten intolerance very seriously here and all Food and Beverage Cast Members are trained on their venue’s gluten-free options and have access to an allergen guide for their location. Since we take pride in the fact that we are a family friendly park, it is important to have food options for even the pickiest of eaters. Our staple item for kids is our Souvenir Lunch Box. This includes a PB&J sandwich, an applesauce pouch, animal crackers, and a Capri Sun. The best part is that all of these goodies come in a cool take-home souvenir box! These are available at the Country BBQ, Kool Cactus, Kidz Cafe, the High Moon Saloon, and Granite Grill. Other great options are the chicken strip basket, hot dogs, corn dogs, cheese quesadilla, grilled cheese, mac n’ cheese, and apples. These are available throughout the park. 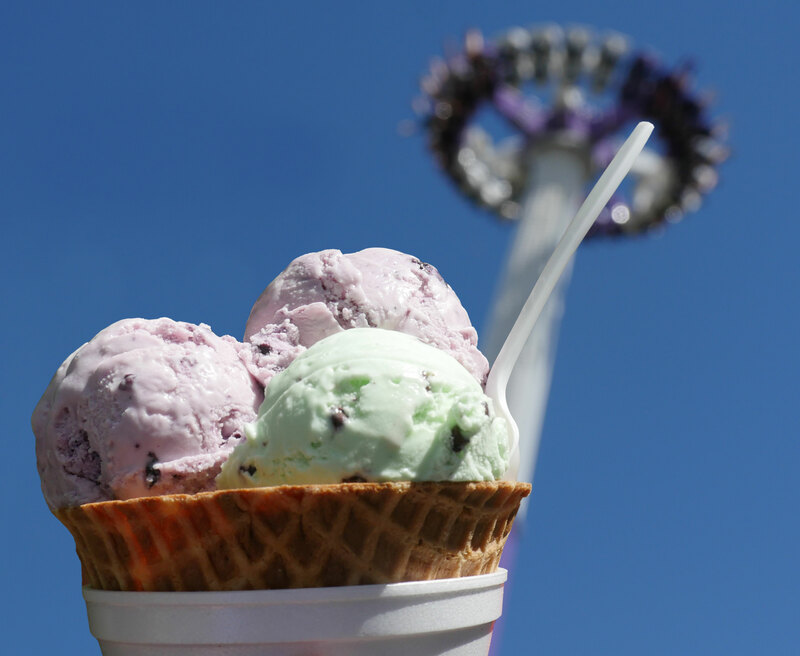 You can’t go to a theme park, and not taste something sweet. To fulfill that sweet tooth, stop by the Country Carnival. You will know when you get there by the aroma of sweet, kettle corn. Here you will be able to taste the caramel apple funnel cake, experience the well known “single scoop” ice cream cone, and bite into some crunchy kettle corn. Throughout the park, you will find multiple Dippin’ Dot locations and other novelty treats that will be sure to give you the theme park sugar rush you deserve. There is a lot to eat at Silverwood, and the best part is that every visit can be new, exciting and memorable. If you have any tips, tricks, or secrets on your ideal dining plan, please share a comment below. As always, we are looking forward to seeing you this summer and we hope that you have a blast during your visit! Enter-to-win tickets to Silverwood for the 2018 season! Will there be any other chances to win a giveaway?! Hi Amy, There will be a ticket giveaway every week, so keep an eye out! Looking for chances for free or discounted tickets . The main gate store is a great stop for souvenirs..
.. and yummy fudge to take home and have a little piece of Silverwood. It’s a common last stop on our way out, the kids always ask and I secretly browse the sweatshirts and hats. You can get your souvenir pennies there too!! This local family LOVES Silverwood! am taking 8 of us, and am on a strict budget. It would be easier to buy in the park, but we cannot afford high prices, especially if it is not enough for a meal for everyone like most parks are. I am also trying to decide if it is worth a souvenir cup or not. How much are the souvenir cups? Hi Shannon! Our food prices are family friendly, and we even have another blog post about experiencing our park on a budget. For example, we have an all you can eat BBQ for only $12.99! The Silverwood Sports Bottles are also a good investment when looking to save money. Each bottle is only $9.49, and then each additional one after that is only $7.49. You get unlimited drink refills the day of purchase, and then every day after that it’s only 99 cents! If you aren’t interested in eating in the park, we do also have picnic tables outside the park if you would like to bring your lunch and eat there. First timer here.. Was wondering if you have or know about a detailed plan on how to hit every ride in one day and is there any fast passes or line skip things I can purchase?? We do not currently have a fast pass program. But it is definitely possible to tackle the whole park in one day. I will get started on another blog post to help map out a single day, but I would just go ahead and look at our park map and then write out all the rides that you don’t want to miss. I also have a two day guide that might be helpful for you as well. Hope to see you this summer! Looking for the best vegetarian options in the park?? Thank you fall the hints, but most of I love that silverwood thinks about the earth with refill cups, but also on family budget. I love to go back to places that understand real families. Thank you Silverwood, see you August 26 &27…. My wife loves the fudge. Can it be ordered online and shipped?